GRAND JUNCTION — Colorado’s U.S. Sen. Michael Bennet on Saturday night sparred with Republican challenger Darryl Glenn over bipartisanship and who meets most often with state residents. Bennet and Glenn were taking part in their first debate with each other at the Club 20 fall meeting here. 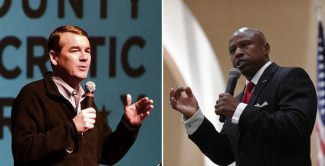 Bennet challenged Glenn on his statements about refusing to cooperate with Democrats. The incumbent stepped from behind the lectern to approach the audience in his opening, stressing his efforts at bipartisanship, citing examples such as a federal farm bill, immigration reform and energy development. Visit www.denverpost.com to read the rest of this story. Democratic U.S. Sen. Michael Bennet starts the race against his Republican rival with more than $6 million in the bank, a huge cash advantage exacerbated by Darryl Glenn’s poor fundraising to date. The Bennet campaign will announce Monday that it raised $2.7 million in the second quarter, boosting the Denver lawmaker’s cash-on-hand to $6.1 million as of July 1. 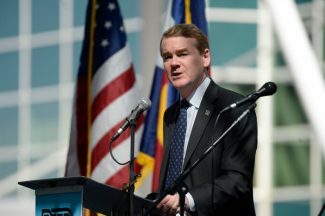 The fundraising total is $1 million more than Bennet posted through June 8 in the pre-primary report, but he continued to spend big dollars. His cash-on-hand June 8 stood at $5.7 million. Glenn starts July essentially broke. His campaign reported June 8 that it only raised $106,510 since April 1 and had just $50,198 on hand with $16,500 in debt, according to federal campaign finance filings. In the final days before the June 28 GOP primary, however, he received a $50,300 boost from major donors of $1,000 or more, thanks to support from political allies of Sen. Ted Cruz and Sarah Palin. Only $6,400 of that money came from Colorado. to read the rest of this story.